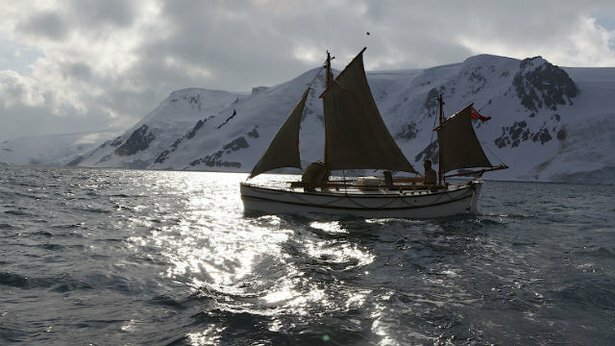 Chasing Shackleton re-aired August 12, 2014. Follow Tim Jarvis as he tries to uncover what happened on Shackleton’s journey of survival. The series follows a crew of five intrepid explorers led by renowned adventurer, scientist and author Tim Jarvis as they re-create Shackleton’s epic sea-and-land voyage in a replica of the original explorers’ boat, using only the tools and supplies his team used. Sir Ernest Shackleton’s Trans-Antarctic Expedition, which launched in 1914, met with disaster when his ship The Endurance was crushed by arctic ice and sank. His heroic leadership in the face of almost certain death saved the lives of 27 men stranded in the Antarctic for more than 500 days, and has inspired explorers and leaders across every continent over many generations. Jarvis’ team’s recreation included crossing the treacherous Southern Ocean from Elephant Island to South Georgia (800 nautical miles) in a small wooden boat while battling gales, rough seas and stomach-churning swells. Once on land, the crew faced weather conditions they described as “Scotland on steroids” — simultaneous high winds, torrential rain, snow, hail and ice. When the weather eased, Jarvis and two teammates (Barry Gray and Paul Larsen) trekked inland to reach an old whaling station at Stromness on South Georgia, traversing an icy, crevasse-riddled mountain range in unmapped territory, the route Shackleton and his men took as their only hope for rescue almost a century ago. The expedition, which occurred over three weeks in early 2013, had been in development since 2008 when Shackleton’s granddaughter Alexandra approached Jarvis with the idea to honor her grandfather and his heroic achievements. After agreeing to the challenge, Jarvis selected a team of British and Australian adventurers based on their determination, passion for adventure and their sailing and climbing skills. Jarvis’s vessel, named Alexandra Shackleton, was an exact replica of the James Caird, from its hand-stitched sails made from 1914 sailcloth down to the brass screws that held its wooden planks together. To complete the authentic experience the team used 100-year-old equipment, navigational tools and period clothing that, perhaps, helped them unlock Shackleton’s survival secrets, and gain insight into the original crew’s courage. State-of-the-art cameras were built into the boat and expedition cameraman and director Ed Wardle joined the crew to capture the action as it happened. Discovery Communications Europe and PBS. Can six men endure Sir Ernest Shackleton's Antarctic rescue mission today?